Recently, some readers emailed me to ask about the legitimacy of a new trading software that goes by the name of Dubai Lifestyle App. Upon close scrutiny and a nightmarish experience (loss of all trading funds) of my friend, I’ve concluded that Dubai Lifestyle App is a scam. There are actually a wealth of evidence in their sales material that points to this conclusion, and today we’ll examine them one by one in this in-depth Dubai Lifestyle App review. The alleged owner of the app, Scott Hathaway claims that his software can make each of his beta testers $7,000 every single day, and he is only taking in 100 beta testers from around the globe. Once all the spots have been taken up, you won’t be able to find the page again, and you would’ve lost your chance forever. I’ve seen this marketing tactic time and time again, and there’s an easy way to find out if he is telling the truth. Refer to the screenshot above. See the “remaining spots” counter on the top left hand corner, and the “remaining time” countdown timer on the top right hand corner? As you watch their sales video, these counters keep counting down, as if your time is running out and people are taking up the slots rapidly. As an inexperienced internet user, you may start to feel uneasy and compelled to take up the offer before it expires. Don’t. Instead, remember the number of spots available and remaining time at the moment. Refresh the webpage by pressing F5 on your keyboard. No matter how many spots or how much time is left, the counters will invariably reset to 79 spots and 11:06 minutes remaining. How did you recover the lost spots and time just by refreshing the page? The truth is, there was never limited time and spots to begin with. These counters are pre-programmed to countdown every time the webpage is loaded. It’s a shady tactic used by countless scams to force their victims into action. 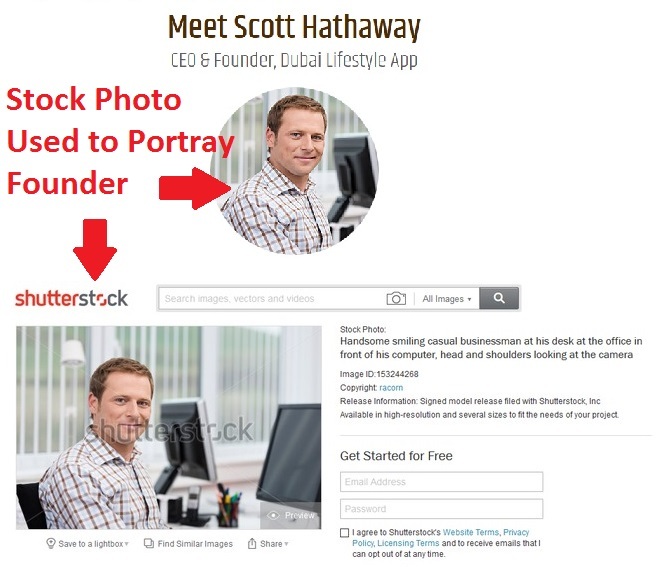 Below the sales video, we can find the picture of the alleged owner for Dubai Lifestyle App, Scott Hathaway. I tried to look for his picture on the internet to authenticate his identity, and turns out that the picture was a stock photo purchased from shutterstock. Stock photos are basically royalty-free images that anyone can purchase from vendors like shutterstock for advertising purposes. Once you buy it, you can use it anyway you like without copyright issues. 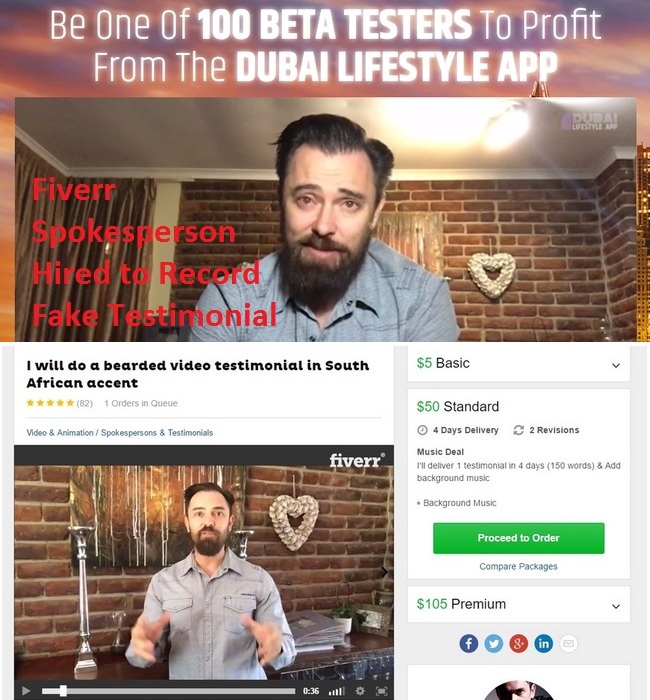 Apparently, the scammers behind Dubai Lifestyle App bought this photo from the vendor and created a fake character, portraying him as the founder and CEO of the software. This also explains why Scott Hathaway has never made any appearance in the sales video. All his speeches are narrated by text. This is because the video was narrated by a narrator, instead of the man in the picture. Scott Hathaway simply does not exist. Within the sales video of Dubai Lifestyle App, there are a few members who claim to have made a fortune with the software. These testimonials not only give a confidence boost for victims who are still hesitating to sign up, but they also make the scam appear legitimate. My friend fell for the scam because he believed these testimonials were real. 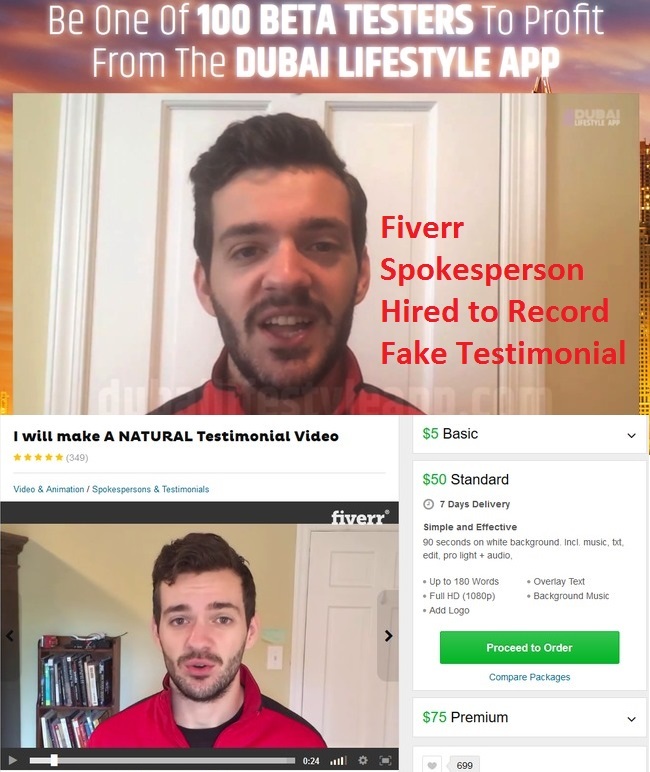 In fact, the video testimonials were bought from Fiverr.com for as low as $5. These semi-professional spokespersons make a living by selling scripted testimonials. Take a look at the gig description for the spokesperson above. The buyers (in this case the scammers) have to provide the script, which means they can get the spokesperson to say whatever they want. For obvious reasons, you cannot base your purchasing decision on these fake testimonials. Here’s another fake member testimonial purchased from Fiverr. To these spokespersons, their job is to read whatever is written in the script like a piece of real testimonial, and they will get paid. They don’t care if the content of the scripts are ridiculous lies. They have not used the software before, let alone generating huge profits from it. How Does the Software Make Money Off You? If you decide to sign up for Dubai Lifestyle App, you will be required to open a new broker account with their partner brokers, which are unregulated by monetary authorities. Once you fund your trading account with at least $250, Dubai Lifestyle App will be activated to generated automated trades on your behalf. The losses are pocketed by the broker, which is then shared with its partner-in-crime – the scammers behind Dubai Lifestyle App. DUBAI LIFESTYLE APP IS A SCAM. I strongly advise you to stay away from the scam if you don’t want to lose your hard-earned money. Thanks for exposing the scam, I was starting to get carried away and think that there’s free automated software in the world! Hey Carlton, glad I could help. Just remember that if something sounds too good to be true, it’s probably out to get you! Exercise caution at all times.